Even though Thanksgiving has taken a secondary place with Black Friday and Cyber Monday in the marketing of the seasons, it’s not something you should overlook. Thanksgiving is a time to focus on gratitude – being grateful for your accomplishments, for what you have, and taking the time to reach out to others who are part of your journey. So although Thanksgiving is a U.S. holiday, it’s a day that can deliver meaning all over the world. Whether you use Twitter, Facebook, Instagram or LinkedIn, you can boost your connection with your social media community. Just look at these five ways to say thank you. Introduce a connection to someone new. If you haven’t engaged with a person before, look at their profile to see if it’s appropriate for you to introduce them to another person in your network. Let them know that you think this could be a positive connection for each of them. Engage with someone’s content. Moreover, let them know what you think. Whether it’s a blog, website, or post make sure you add your thoughts in the comments. Your connections spend loads of heartfelt time creating their content. The fact that you stopped, read it and then commented on it will be very much appreciated. On a LinkedIn status update, a Twitter tweet, or an Instagram or Facebook post give thanks to a person for a blog post, a presentation or for being a loyal client. Make sure you use their name by using the @ followed immediately by their username. You’ll be able to select the person you’d like to acknowledge from a drop-down list. When you mention them, they’ll receive a notification. Imagine how appreciative they’ll feel that you took the time to recognize them. Thank your influencers on social media for the advice they provided and lessons they shared. If you reach out to them in a natural way, you might start building a relationship which could lead to working with them in the future. Thanksgiving isn’t just a time to give thanks but to receive some as well. By reaching out to your happy clients, you can ask not only for a referral but also a testimonial. However, make sure you show thanks by letting your client know that their actions are appreciated. You can then highlight them and the review on your website, in a tweet, status update or a post. What do you think? Do you agree or disagree? 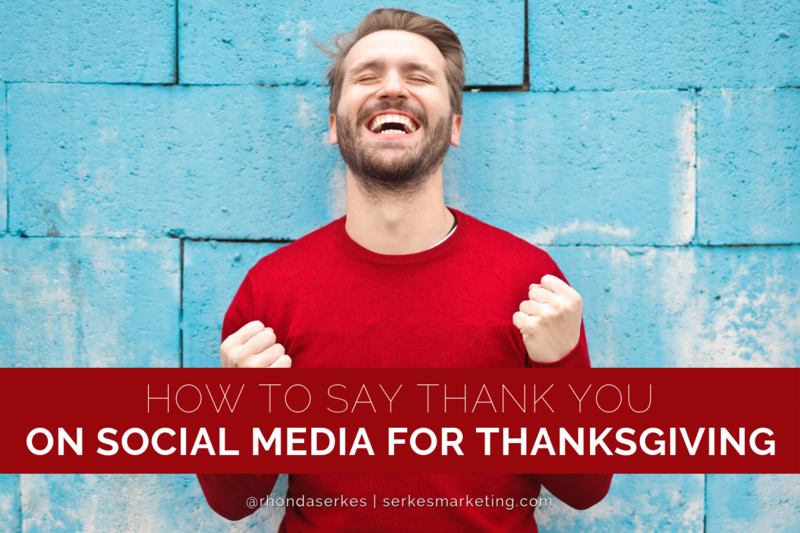 Do you know how you’re going to say thank you for this Thanksgiving on social media? Tell me your thoughts even if it’s a “thanks for your post” in the comments below.